Food provides the energy and nutrients that babies need to be healthy. For a baby, breast milk is best. It has all the necessary vitamins and minerals. Infant formulas are available for babies whose mothers are not able to or decide not to breastfeed. Infants are usually ready to eat solid foods at about 6 months of age. Check with your health care provider for the best time for your baby to start. If you introduce one new food at a time, you will be able to identify any foods that cause allergies in your baby. Allergic reactions include a a rash, diarrhea, or vomiting. Babies who have mild to moderate eczema have a higher risk of food allergies. They usually can eat peanut products at about 6 months of age. If you have concerns about this, check with your baby's health care provider. Babies who have severe eczema or egg allergies are at high risk for peanut allergies. If your baby is at high risk, check with your baby's health care provider. Your baby may need allergy testing. Your baby's provider can also recommend when and how to give your baby peanut products. Do not give your baby honey before 1 year of age. Honey may contain bacteria that can cause botulism in babies. Unpasteurized drinks or foods (such as juices, milks, yogurt, or cheeses) may put your child at risk for an E. coli infection. E coli is a harmful bacteria that can cause severe diarrhea. Certain foods that can cause choking, such as hard candy, popcorn, whole nuts, and grapes (unless they are cut into small pieces). Don't give your child these foods before age 3. 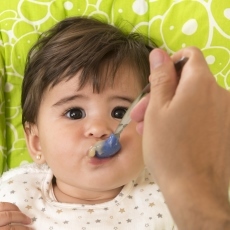 Article: Solid Food Introduction and the Development of Food Allergies. Article: An update on complementary feeding.